Hope it is not to late to post my finished Halloween Table Topper. This is the front view. 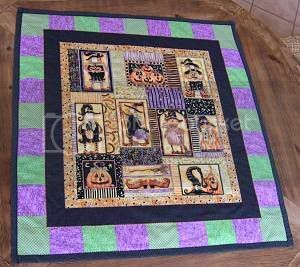 The most time consuming part was cutting out the green and purple squares and sewing them into strips for the border. This is the back side. 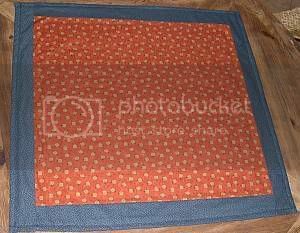 I used a small pumpkin print for the center and a black fabric with tiny white flowers for the border. This side I can use through Thanksgiving. I am pleased with how it all came together and fits my table nicely. You can find me over at Alpaca Rose.